Knight Shift took first place to become Mount Michael’s first State Championship winners! They were also awarded the state driver’s skills award for the top driver in the state, Nick Huetter. In addition, Knight Shift was awarded the event’s Presidential Award for overall excellence both on and off the field. 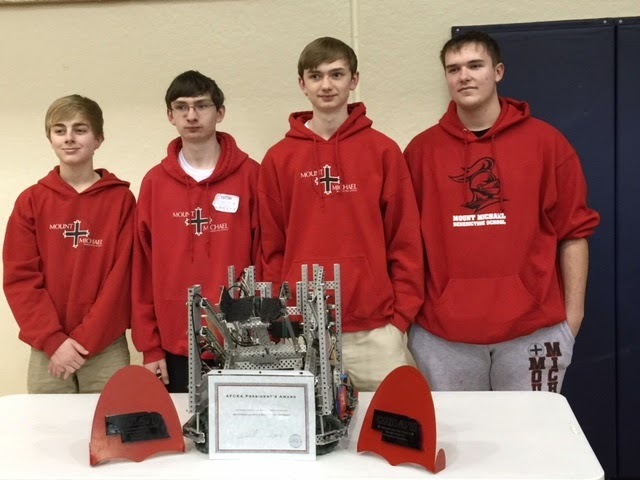 Also competing at the World Competition were the Talladega Knights: Chase Goddard, Will Fleissner, Blake Worsham, Ethan Tylski and Lukas Williams. They finished in 18th place in their division. They finished in 50th place in programming skills.